JainMatrix Investments takes a long hard look at 2018 and then builds the 2019 Outlook. CY2018 was a challenging year for investors. Many global equity indices gave negative returns, see Table 1. The Indian markets in 2018 were affected by various domestic and international factors. The introduction of LTCG tax in Jan 2018 started the negativity after a very positive 2017. Mutual Fund schemes were reclassified as mandated by SEBI, which led to MFs shifting the funds to LC stocks from Mid, Small and Micro caps and a sharp correction in MSM share prices. This was unexpected. There were corporate scams (Punjab National Bank and Gitanjali Gems), auditor resignations and a new surveillance system (ASM framework) put in place by the exchanges to curb excessive trading. The unfolding of the IL&FS crisis and the liquidity stress affected the NBFC sector. Brent crude prices rose to $84/barrel creating worries over India’s deficit. The INR also weakened to Rs. 75/USD. Crude rose from May-Sept 2018 only to plunge sharply after that. GDP rose sharply, as did govt. spending in Infra space. Inflation fell, giving debt investors better real returns. Domestic investors moved into equity even as FIIs withdrew from debt & equity markets. Broader corporate earnings improved after a weak 2017 due to Demon and GST. Exports sectors like IT and gems & jewellery did well due to USD strengthening against INR. See Fig 2. It can be seen that Nifty fell after Sept then recovered to stay positive by year end. Mid-caps and Small caps did badly in 2018. This was a Risk-Off year after Risk-On years of 2016 and 2017. In USA Trump reduced taxes, which gave a boost to the markets. However he soon imposed tariffs on China and broke international agreements. Interest rates were raised by the Fed. after 8-10 years of quantitative easing and low rates. The govt. has shutdown following Trump’s order for a demand to build a wall between USA and Mexico. 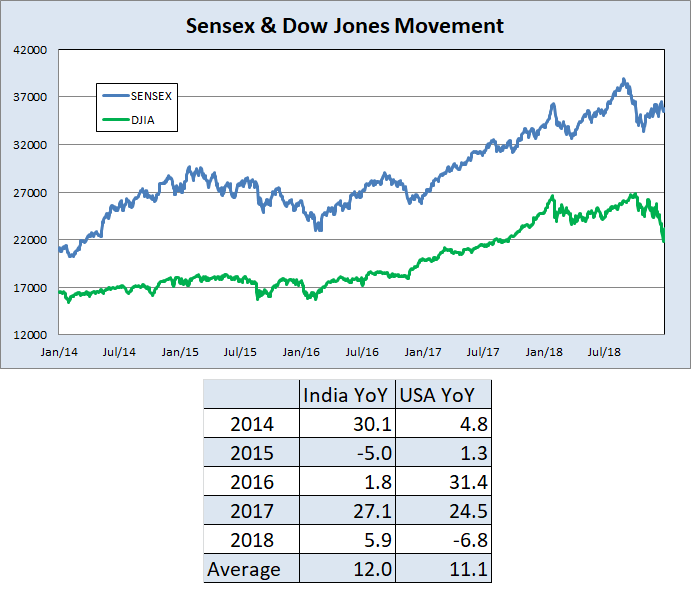 A look at Dow Jones Industrial Average (USA) and Sensex, see Fig 3, indicates that over the longer term there is a similar pattern. However in the shorter duration the movements could be more influenced by domestic factors playing out. 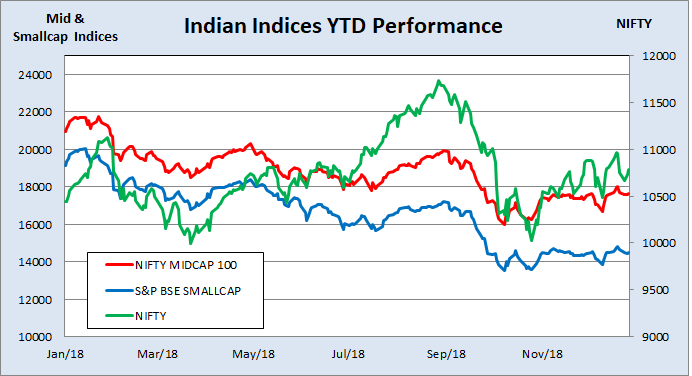 Fig 4 shows the year wise performance of these Indices. On Interest rates there should be a reduction by RBI as inflation is in check and growth will be encouraged. Elections: The Rajasthan, MP and Telangana election results were BJP losses but the market was not affected. Our feeling is that coming elections will be hard fought. However the worst case scenario is not very bad for the markets and India is on a growth and reforms path that should continue. Currently the BFSI sector is recovering from the IL&FS and liquidity crisis. The central govt. and RBI have taken measures to resolve these. Interest rates have hardened. The NCLT lead NPA resolution process is bringing confidence back to markets and strengthening Banks. Auto sector is slowing in Q3, partly due to credit issues. Cement is seeing good volumes but weaker margins. Capital goods, construction and infra are positive. Power sector looks steady. Consumption sector remains strong. Real estate is weak due to RERA, GST and crackdown on black money. Demand for new housing will remain weak until prices correct, except in affordable segment. Rentals demand will be robust. We do have a situation where GoI will increase public spending. In the private sector, growth is pushing capacity utilizations, profitability is increasing and there is some reduction in overall corporate debt levels. Given weakness in USA, Europe, China and Japan, India may become a favorite again among Emerging Markets for FII flows into equity and debt. The outlook on USA equities is bearish on fears of slowing growth, govt. uncertainty and rising interest rates. The tariff war is more harmful to American business, and the Trump brand is causing uncertainty. In Fig 4 India on average has seen 12% growth in 4 years, lower than the long term Sensex average of 13-14%. We expect a mean reversion to higher levels. Post elections, we project a return to Risk-On for Indian stock markets. Long term investors can expect markets to be weak in H1 CY2019 and a recovery post elections. We wish our readers a happy and prosperous new year! This document has been prepared by JainMatrix Investments Bangalore (JM), and is meant for use by the recipient only as information and is not for circulation. This document is not to be reported or copied or made available to others without prior permission of JM. It should not be considered or taken as an offer to sell or a solicitation to buy or sell any security. The information contained in this report has been obtained from sources that are considered to be reliable. However, JM has not independently verified the accuracy or completeness of the same. Neither JM nor any of its affiliates, its directors or its employees accepts any responsibility of whatsoever nature for the information, statements and opinion given, made available or expressed herein or for any omission therein. Punit Jain has no shareholding in any listed firm mentioned in this article. Recipients of this report should be aware that past performance is not necessarily a guide to future performance and value of investments can go down as well. The suitability or otherwise of any investments will depend upon the recipient’s particular circumstances and, in case of doubt, advice should be sought from an independent expert/advisor. Punit Jain is a registered Research Analyst and compliant with SEBI (Research Analysts) Regulations, 2014. Any questions should be directed to the director of JainMatrix Investments at punit.jain@jainmatrix.com.